A regional analysis has been conducted to identify the potentially more favourable regions for cross-border co-operation initiatives. Field‑level case studies have been carried out on 137 actors involved in cross‑border co‑operation at the level of West Africa as a whole, and in three micro‑regions: the Senegal River valley, Liptako‑Gourma, and the Lake Chad basin. These studies use the specific methodology of social network analysis, which focuses on the links maintained between actors in a specific area of activity. Several rounds of face‑to‑face interviews with actors involved in cross‑border co‑operation have helped to create an original map of cross‑border networks. Very little is known about how actors engaged in policy networks co-operate across national borders, especially regarding the cross-border circulation of information and resources. This mapping study analyses the relationships between public actors: How do social context and informal ties shape relationships between border actors in West Africa? Who are the actors or groups of actors, which have formal power and which may influence decisions in a more informal way? How do these actors co-operate when faced with different or conflicting institutional frameworks? What is the most appropriate level of activity for cross-border co-operation? One major challenge of regional integration lies in adapting the spatial scale of institutions to the scale of economic activities. The appropriate level of economic activities is usually defined by the boundaries of functional regions, i.e. internally cohesive and well-connected areas, whereas institutions are usually based on administrative units. Actual institutional units rarely match their functional counterparts and, as a result, the economic challenges faced by regions are not adequately addressed, particularly if legal and regulatory frameworks differ. By identifying the economic potential of border areas, this strategic reflexion cycle addresses the following questions: How to develop opportunities and respond to the needs of cross-border regions? How can these areas be more strongly connected; and what role could they play in the context of organising the West African territory? How can a network approach to cross-border co-operation help decision-making? A network approach illustrates how actors co-operate and may influence decisions. A better understanding of the overall structure of policy networks can improve the co-ordination between the various partners (donors, regional organisations, private actors, state actors, local municipalities) involved in cross-border co-operation. What are their conflicting or co-operative goals, and how do they influence each other? How could the network evolve with a view to strengthening cross-border governance in the region? The data visualisation of this network approach will offer a complementary reading to more traditional forms of analysis. Cross-border co-operation is a local initiatives approach through which actions are formulated and implemented by private and public local actors from two or more countries residing in cross-border areas. This approach is based on the agreement and support of the governments of the countries concerned, with two objectives: i) Improve the living conditions of cross-border populations who are often marginalised; and ii) Concretely build regional co-operation. This innovative approach to the regional integration process was first put forward in the early 2000s by Alpha Oumar Konaré, the former President of Mali, who called it the “cross-border area” concept aimed at promoting the existence of border regions that share common physical and human characteristics. 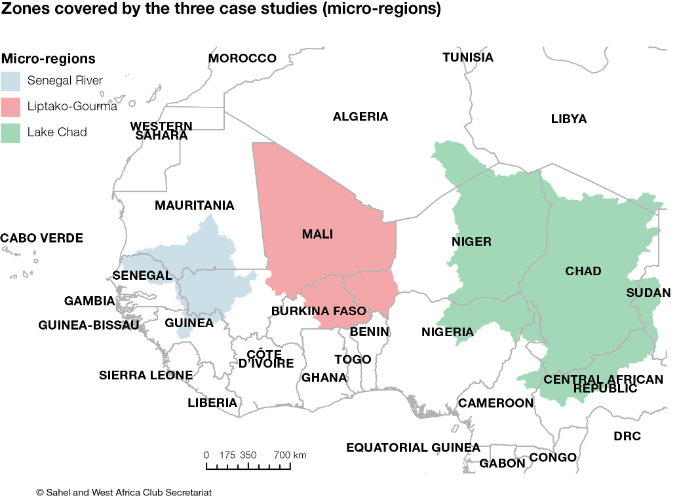 This concept is used today by ECOWAS to promote local integration, and the African Union explicitly mentions the “geographical areas straddling the border lines of two or more neighbouring states and inhabited by people linked by socio‑economic and cultural relations” in its programme dedicated to cross‑border co‑operation. The SWAC Secretariat has a long experience in cross-border co-operation issues. Work was launched in March 2002 when the government of Mali organised a meeting on the cross-border area concept, with the support of SWAC. This meeting provided the initial impetus to launch an ambitious process aimed at promoting the implementation of cross-border co-operation programmes and pilot operations, developing synergies and sharing experiences and information. For the 2015-16 thematic cycle on cross-border co-operation, the SWAC Secretariat teamed up with the Department of Border Region Studies at the University of Southern Denmark (SDU) which co-ordinates work with an international team of researchers.